The Hawthorne Inn & Conference Center offers guests a selection of 156 spacious and well-appointed guest rooms, 12 luxury suites, 1 Presidential Suite, and 1 Jacuzzi Suite. Each spacious room at the Hawthorne Inn & Conference Center is designed with your comfort in mind. For your convenience, we provide an entirely non-smoking property and non-smoking guest rooms. All rooms are equipped with flat-screen TVs with premium cable channels, complimentary WiFi, climate control, a microwave and refrigerator, a table, an alarm clock, room safe, an iron, a private bathroom fitted with a bathtub or shower, complimentary toiletries and a hairdryer. Some rooms and suites additionally feature a custom built workstation, sofa bed, a parlor, a kitchenette, and a separate living room. In-room coffee is available in all of our guest rooms. Let our helpful and friendly staff make your stay in Winston-Salem stress free and enjoyable. We have a 24 Hour Cancellation Policy. If you wish to cancel or modify a reservation, you must do so by 3 PM 24 hours or 1 day prior to your arrival date. If you cancel or modify post the expiration of the Cancellation Period or you fail to show up, a no-show charge will be levied on your credit card for one full night. The Hawthorne Inn & Conference Center in North Carolina sits 23 miles west of the Piedmont Triad International Airport. 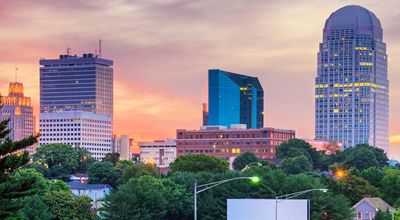 Our premier location in downtown Winston-Salem is within walking distance to North Carolina’s top attractions, sports arenas, theaters, concert halls, opera houses, universities and colleges, trendy restaurants and pubs, art galleries, vineyards, and unique shopping. Public transportation is abundant in Winston-Salem; guests will find the Winston-Salem Transit Authority just 4 minutes from our hotel. We invite you to enjoy the nightlife while visiting our hotel in downtown Winston-Salem North Carolina. The Hawthorne Inn & Conference Center provides guests with a 24-hour friendly front desk staff, concierge service, as well as baggage storage. We also have an on-site ATM, a business center, newspapers, 10,000 square feet of meeting and event space, and complimentary WiFi that is available throughout all areas of the hotel. Our hotel also features a seasonal outdoor pool and fitness center. For your added convenience, we feature on-site guest laundry, dry cleaning services, on-site vending machines that serve a variety of snacks and beverages. Complimentary parking is available for registered guests of the hotel. Up to three children under the age of 18 stay free when using existing beds. Max number of cribs per room is 1. Any crib or extra bed is upon request and must be confirmed by management. This property is privately owned, and the management reserves the right to refuse service to anyone and will not be responsible for accidents or injury to guests or for loss of money, jewelry or valuables of any kind. Once checked in, no cancellations. All linens are inventoried: missing or damaged linens will be charged. Any damages to hotel property will be charged an additional fee upon assessment. This is a NON-SMOKING facility. Guest acknowledges that smoking is not allowed in guest room or within hotel facility. If anyone in guest's party smokes in the guest room, guest hereby expressly authorizes hotel management to charge credit card the amount to reimburse the property for the additional cost of cleaning guest room. If your reservation has been paid in advance or you elect to pay by cash, a security deposit via credit card will be required upon check-in and will be charged in the event that damages outlined herein occur.